Many teens in relationships view social media as a place where they can feel more connected with the daily contours of their significant other’s life, share emotional connections and let their significant other know they care – although these sites can also lead to feelings of jealousy or uncertainty about the stability of one’s relationship. At the same time, even teens who indicate that social media has had an impact on their relationship (whether for good or for bad) tend to feel that its impact is relatively modest in the grand scheme of things. 59% say social media makes them feel more connected with what is going on in their significant other’s life, although just 15% indicate that it makes them feel “a lot” more connected. 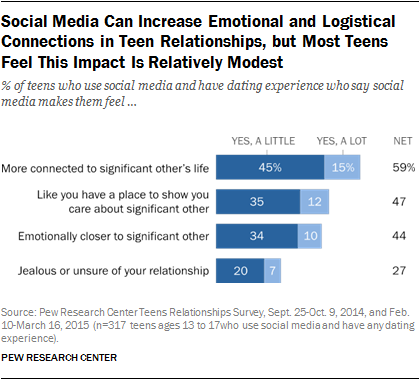 About one-third (35%) of these teens say social media does not make them feel more connected with their significant other. 47% say social media offers a place for them to show how much they care about their significant other, with 12% feeling this way “a lot”; 45% do not feel that social media offers a venue for this type of interaction with their significant other. 44% say social media helps them feel emotionally closer to their significant other, with 10% feeling that way “a lot.” Half (50%) do not feel that social media offers a space to feel emotionally closer. 27% say social media makes them feel jealous or unsure about their relationship, with 7% feeling this way “a lot.” Roughly two-thirds (68%) do not feel jealous or unsure of their relationship due to social media. Boys are a bit more likely than girls to view social media as a space for emotional and logistical connection with their significant other. Some 65% of boys with relationship experience who use social media agree that these sites make them feel more connected about what’s going on in their significant other’s life (compared with 52% of girls). Similarly 50% of boys say social media makes them feel more emotionally connected with their significant other, compared with 37% of girls. At the same time, even among boys this impact is fairly muted: Just 16% say social media makes them feel “a lot” more connected to their significant other’s life, while just 13% feel “a lot” more emotionally close to their significant other thanks to social media. As seen in our report on teen friendships, social media allows users to curate their online presence in a way that puts their best digital foot forward, or shows a different side of their personality than they can show offline. At the same time, this self-presentation can sometimes appear inauthentic or phony to others. Teens are especially attuned to this type of social curation: When it comes to teen friendships, fully 85% of teen social media users agree that social media allows people to show a side of themselves that they can’t show online. At the same time, 77% agree that people are less authentic and real on social media than they are in real life. 42% agree that their significant other shows a different side of themselves on social media than they do in person, with 9% agreeing strongly. Nearly six-in-ten (58%) disagree with this statement. 36% agree that their significant other is less authentic and real on social media than they are offline, with 7% agreeing strongly. Roughly two-thirds (64%) disagree. Girls are more likely to “strongly disagree” with the notion that their partner shows a different side of themselves on social media than they do offline: 13% of girls strongly disagree with this statement, compared with just 4% of boys. On the other hand, there are no differences between boys and girls on the question of whether their partner is less authentic on social media than they are in real life. For a substantial minority of teens, social media offers a space to publicly express affection or solidarity with their romantic partner. Some 37% of teens with dating experience have used social media to tell their significant other how much they like them in a way that is visible to other people. 47% of those from households earning less than $50,000 annually have used social media to publicly express affection for a significant other (compared with 33% of teens from higher-income households). 54% of those who have met a partner or significant other online have used social media in this way, compared with 32% of those who have not met someone online. Beyond publicly displaying affection and one’s own relationship, social media is a space where many teens can express public support or approval of others’ romantic relationships: 63% of teens with dating experience have posted or liked something on social media as a way to indicate their support of one of their friends’ relationships. Girls are especially likely to publicly support their friends’ relationships using social media (71% of girls with dating experience have done so, compared with 57% of boys) although boys and girls are equally likely to publicly express affection for their own partner in social media environments. In addition, teens from less well-off households (those earning less than $50,000 per year) engage in each of these behaviors at higher rates, compared with those from higher-income households. Among lower-income teens with dating experience, 73% (compared with 59% of higher-income teens) have supported their friends’ relationships on social media, while 47% of less well-off teens (and 33% of higher-income teens) have publicly expressed affection for their own partner in a public way on social media. Teens in our focus group explained specific ways in which a relationship might be displayed on social media. As a high school boy related, people in relationships change “their status. And then other times, on Instagram it says in their bio, they put like the date that they started going out.” Changing “profile pictures and then just regular pictures,” to be images of the couple is also a common method of displaying one’s relationship and relationship status. A high school boy explained what he believes must be on social media when dating someone. “You’ve got to put the date in the bio and her in the bio. For real. … You need to have the padlock emoji with a heart and two people holding hands. …On Facebook, you’ve got a cover photo… Or a date. Or just a date,” plus your beloved’s username or profile. High school boy 1: You just want people to know. With some people, it’s for the attention and stuff like that. High school boy 2: Well, speaking in terms of the way people generally seem to behave, it’s victory. High school boy 1: And it’s also probably to tell people like, hey, back off. She’s mine or he’s mine. But even as they use social media to support their friends’ relationships, many teen daters express annoyance at the public nature of their own romantic partnerships on social media. Fully 69% of teen social media users with dating experience agree that too many people can see what’s happening in their relationship on social media, with 16% indicating that they “strongly” agree. Just 31% of such teens disagree with this statement, and only a small percentage (2%) disagree “strongly.” Boys and girls, older and younger teens, and those from higher- and lower-income households are equally likely to agree with this statement.